On March 31, 1969 Radioman Seaman Bruce McIver was wounded by a Viet Cong rocket propelled grenade that struck his T-131-7 boat during an intense ambush on the Giao Hoa Canal south of Ben Tre in Kien Hoa Province. After putting out a gasoline fire started by the flying shrapnel, Seaman McIver rushed over to attend to the serious wounds of a hospital corpsman who was along on the operation. Realizing that the corpsman’s life was threatened, McIver performed an emergency tracheotomy. 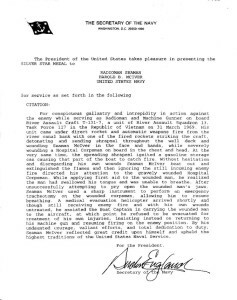 After loading the corpsman on a medevac helicopter, Seaman McIver returned to help suppress the Viet Cong ambush. BM1 John Thibadeau, Boat Captain of T-131-7, began the process of putting Mr. McIver in for the Silver Star Medal for his heroics. Somewhere along the line the recommendation was lost or not followed up on. Bruce and John found one another in 2003 after many years of searching. 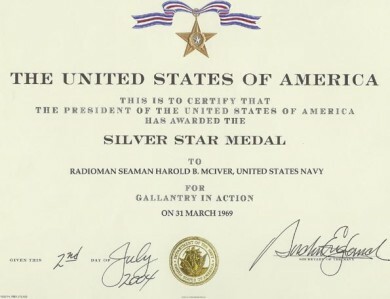 Soon after John contacted the Secretary of the Navy regarding the Silver Star award. The paperwork was re-initiated and Bruce received his much deserved Silver Star Medal 34 years after his heroic efforts. For years Bruce did not know the name of the corpsman or if he lived. 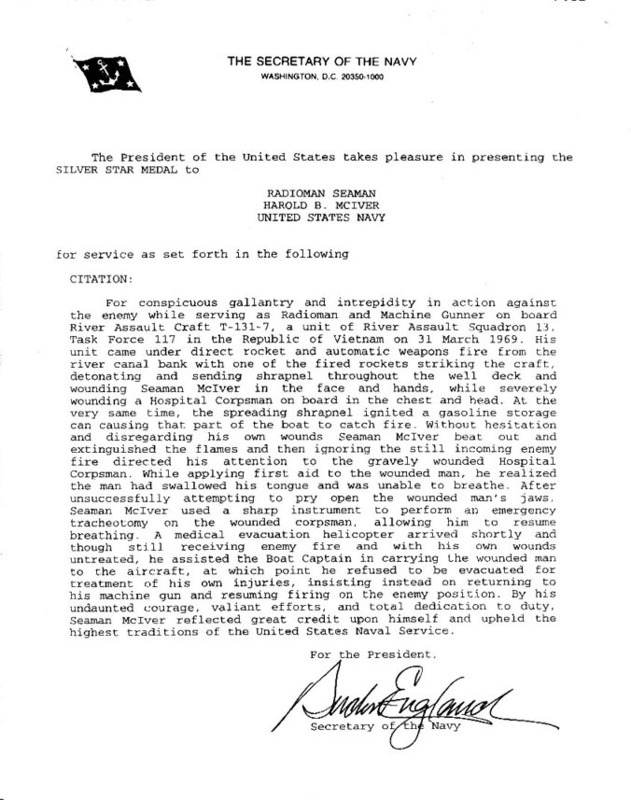 While perusing the Naval Archives in April of 2003 he located a document listing the wounded from the March 31, 1969 ambush. The corpsman’s name was Zeph Lane. There was a “next of kin” address so Bruce tried calling the number when he arrived back to his motel room. Much to his surprise, Zeph’s mother answered the phone. She reported good and bad news. The good news was that Zeph had not only survived, but he had become a doctor and a pilot. In the early to middle 1980’s he returned to the site where he was seriously wounded and helped build a medical clinic. The bad news was that his private plane crashed shortly afterwards killing he and a relative. Through the process Bruce has received some much needed “closure”. He is now in contact with Zeph’s widow and children. New life is coming out of the sufferings and heroics that took place so many years ago during the Vietnam War. In the summer of 1969, President Nixon and his advisors had started to actively turn the war over to the Vietnamese in a program called “Vietnamization.” The U.S. Navy began assuming a large role in this process because massive numbers of U.S. river assault craft, PBR’s, etc., were ceremoniously turned over to the Republic of Vietnam. For a number of reasons, this created a need for U.S. Naval and U.S. Marine advisors to coordinate the war effort and to provide technical and liaison support. Having promised our Vietnamese allies that we would support their effort against the Viet Cong and North Vietnamese Communist aggressors, President Nixon wanted a smooth transition. There was urgent need for men possessing real combat experience to fill the advisor slots, as well as to improve the training of the U.S. officers and petty officers slated to become combat advisors. The new advisors were then in training in the Vietnamese language and culture and in the combat skills required by their future role as combat advisors. The concept of the RAIDs was integration of a completely self-contained Task Force capable of taking the fight to the enemy. 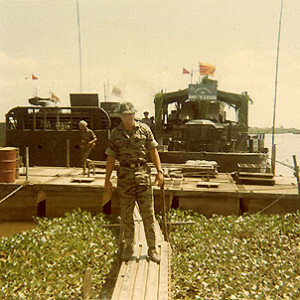 The RAID units consisted of river assault craft manned totally by Vietnamese. The RVN Marines or “Thuy Quan Luc Chien Viet Nam.” formed a proud and capable fighting unit. In addition, we had artillery and air support specifically designated to be available mainly for our operations, including OV-10A “Bronco” aircraft of the VAL 4 “Black Pony” squadron, COBRA gunships, HA(L)-3 “Seawolf” helicopter gunships, Douglas AC-47 “Spooky” gunships, and close air support from Navy carrier air groups, as well as USAF bases in Thailand. By the fall of 1969 we had five (5) RAID Units Operating from Tay Ninh in Operation Giant Slingshot and south to the heart of the U Minh Forest in Kien Giang and Chuong Thien Provinces. As advisors we, in many instances, operated alone with the Vietnamese marine and navy units. Our duties were to coordinate everything between the Vietnamese commanders in the field and the U.S. units and commanders in the vicinity. As American advisors (“Covan My” in Vietnamese), it was imperative that we maintain good relations as well as good communication. When in the field, I lived as the Vietnamese did. They caught our meals from the canals by stringing a net across the canal downstream and dropping a few concussion grenades upstream…instant meal! Plenty of rice, soy sauce and nuoc mam (made from the drippings of fish fermented in a vat—not my favorite!). By having our meals with them, respecting their culture, we fostered in them a new and valuable respect for us as we lived and fought together, and we certainly gained the same respect for them. Although we were attacked in force and heavily outnumbered, the Vietnamese displayed bravery and gallantry in combat against a superior numbered enemy force that had not been witnessed prior to this action. Navy Lieutenant Al Bell, our RAID 72 Senior Advisor, maintained communication with our Vietnamese counterparts throughout the night. * The NVA and VC, monitoring our communications, had waited to attack until our FAC Observer aircraft had signed off for the night to return to base. This resulted in a loss of communications that prevented us from getting any outside support until a nearby medevac helo was able to relay requests for assistance. This resulted in air support from Black Ponies, Spooky A/C gunships, and Cobra gunships assisting. Until their arrival after what seemed like hours of fighting, we had depended totally on the gunfire from the RAID river assault craft and the VNMC and VNN units that had moved to the east bank of the canal. The Vietnamese Marines and Sailors deeply appreciated the U.S. support and would continue to depend upon our assistance. However, they knew they must take over the war because the U.S. was pulling out. By March 1973, the U.S. had pulled out all combat troops. With that withdrawal, President Nixon promised continued financial and other necessary support. In 1975 all U.S. support ceased; Saigon fell to the Communists April 30th, 1975. This in no way diminished the heroic efforts of the Vietnamese Navy and Marine Corps along with their U.S. advisors. I am proud and honored to have served with ATF-211 RAID 72 Naval Advisory Group. The RAIDs made a difference and with continued U.S. support, I think the outcome of the Vietnam War would have been different. I do know that when I returned to the U.S., we were winning the war. In the Mekong Delta and III Corps this success was largely a result of the actions of RAID units that had been established in the fall of 1969. LT. Bell Standing in a severely damaged RAID boat. * Lt. Bell was awarded the Bronze Star with Combat “V” for HEROISM for his actions on November 6th 1969 during the battle at Dong Hung.